(ban'dij), Avoid using this word in the incorrect sense of dressing. 1. A piece of cloth or other material, of varying shape and size, applied to a body part to provide compression, protect from external contamination, prevent drying, absorb drainage, prevent motion, and retain surgical dressings. 2. To cover a body part by application of a bandage. 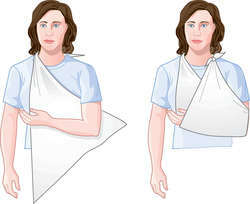 1. a strip or roll of gauze or other material for wrapping or binding a body part. 2. to cover by wrapping with such material. Barton's bandage a double figure-of-8 bandage for fracture of the lower jaw. demigauntlet bandage one that covers the hand but leaves the fingers exposed. Desault's bandage one binding the elbow to the side, with a pad in the axilla, for fractured clavicle. 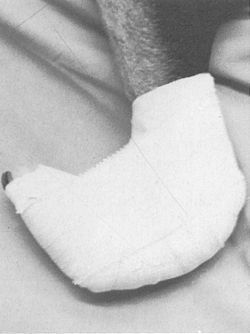 Esmarch's bandage a rubber bandage applied upward around a limb from distal to proximal in order to expel blood from it; the limb is often elevated as the elastic pressure is applied. gauntlet bandage one which covers the hand and fingers like a glove. Gibney bandage strips of adhesive 1.2 cm wide, overlapped along the sides and back of the foot and leg to hold the foot in slight varus position and leave the dorsum of foot and anterior aspect of leg exposed. plaster bandage one stiffened with a paste of plaster of Paris. pressure bandage one for applying pressure. roller bandage a tightly rolled, circular bandage of varying width and materials, often commercially prepared. Scultetus bandage a many-tailed bandage applied with the tails overlapping each other and held in position by safety pins. spica bandage a figure-of-8 bandage with turns that cross one another regularly like the letter V, usually applied to anatomical areas whose dimensions vary, as the pelvis and thigh. 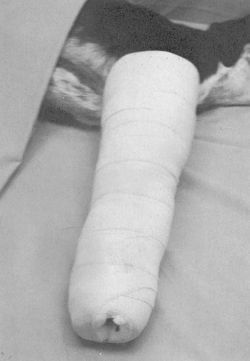 Velpeau's bandage one used in immobilization of certain fractures about the upper end of the humerus and shoulder joint, binding the arm and shoulder to the chest. 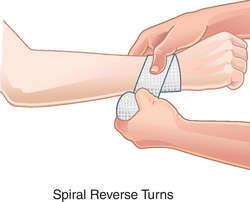 1 a strip or roll of cloth or other material that may be wound around a part of the body in a variety of ways to secure a dressing, maintain pressure over a compress, or immobilize a limb or other part of the body. See also cravat bandage. 2 to apply a bandage. A bandage applied to the chest, e.g., figure of eight (spica). A bandage for retaining dressings. The simple roller bandage for one eye or the monocle or crossed bandage. The binocular or crossed bandage for both eyes is 2 in × 6 yd (5.1 cm × 5.49 m). A bandage with split ends used for the trunk and limbs; a piece of roller to which slips are stitched in an imbricated fashion. Neck spica: Bandage 2 1 2 in × 8 yd (6.4 cm × 7.3 m). Bandage following thyroid gland surgery: Roller bandage 2 1 2 in × 9 yd (6.4 cm × 8.2 m). Adhesive plaster bandage for thyroidectomy: Used to hold dressing on wound in place. A small dressing is applied to center of strip and then applied to back of neck. 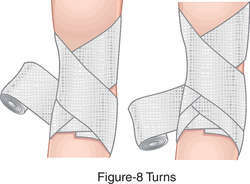 Special bandage: A double-loop bandage of the head and neck made by using a figure-of-eight turn. A long strip of soft material, usually from 1 2 to 6 in (1.3 to 15.2 cm) wide and 2 to 5 yd (1.83 to 4.57 m) long, rolled on its short axis. When rolled from both ends to meet at the center, it is called a double-headed roller. A bandage that is wrapped crosswise on the back. A binder. A strip of woven cotton, wool, plastic, rubber or other material wrapped firmly round any part of the body for a variety of reasons. Bandages may be non-stretch or elastic, conforming or otherwise, adhesive or plain. (ban'dăj) Avoid using this word in the incorrect sense of dressing. 1. Piece of cloth or other material, of varying shape and size, applied to a body part to provide compression, protect from external contamination, prevent drying, absorb drainage, prevent motion, and retain surgical dressings. n a strip of material wrapped about or applied to any body part. n.pr a figure-eight bandage passing below the mandible and around the cranial bone to give upward support to the mandible. 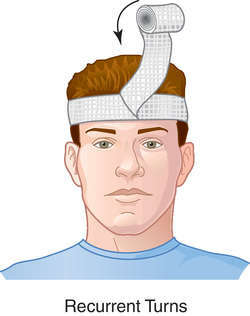 n a large bandage consisting principally of a towel applied around the neck that exerts moderate pressure to the anterolateral part of the neck. The HemCon([R]) Bandage was developed in collaboration with the Oregon Medical Laser Center and Providence St.
Alongside their Big Bandage activity, they also take on regular fundraising for the charity and even helped decorate one of the wards at Christmas time. It's a wrap: Priory team back appeal; BIRMINGHAM CHILDREN'S HOSPITAL HAS THOUSANDS OF SUPPORTERS AND FUNDRAISERS. EACH WEEK WE TELL THE STORY OF ONE OF THE HOSPITAL'S DEDICATED CHARITY CHAMPIONS.. In the past, The Big Bandage supported a particular ward or appeal. If the colour doesn't come back within two seconds, the bandage is too tight and you'll need to loosen it and do it again. recently began offering the Easy Access Bandages Value Pack containing 90 adhesive bandages in varying sizes, all of which feature the company's "patented, easy-to-open grip-pull-stick system that makes bandage application quick and stress-free. The videos showed the Nexcare bandage in "over-the-top situations" in an effort to showcase product benefits. The Action Bandage can be used to protect extremities that are sensitive to pressure or touch by acting as a padded barrier between the body and hard objects, plus it avoids skin tears, bruising, chafing or trauma to a wound. We expect that, when incorporated into a bandage it will allow nurses to quickly identify healing problems such as infection or interruptions to the blood supply, which are typically accompanied by a local increase or decrease in temperature," van der Werff added. Summary: TEHRAN (FNA)- A number of Iranian hospitals welcomed the use of anti-bacterial bandages produced by Nanotechnology Researchers Company with the trademark of Silver-pants for dressing the infected lacerations in diabetic patients. Some doctors are applying bandages made from a substance found in shrimp shells to help stop life-threatening bleeding. He was among the first on the scene and used the first aid kit in his taxi to bandage victims.